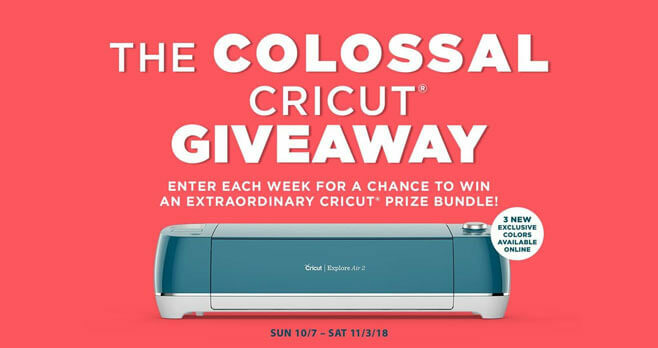 Enter the Michaels Cricut Contest each week by sharing a photo of your project at michaels.com/cricutcontest and you could win an extraordinary Cricut prize bundle. The Michaels Cricut Contest is open to legal residents of the continental United States (including Alaska and the District of Columbia but excluding Hawaii) who are 18 years or older and Canada (excluding Quebec residents) who are of the age of majority in their respective province or territory of residence. The Sweepstakes begins on October 7, 2018 at 12:00:00 am CST and ends on November 3, 2018 at 11:59:59 pm CST. Limit one entry per person per week, for a total of four entries throughout the Contest. The grand prize consists of a Cricut Maker. Visit michaels.com/cricutcontest to enter and see Official Rules for details.